Rava Dosa is an instant variety of dosa that does not require any soaking/fermenting time and it is also very easy, crispy and quick to make. Mix all the above ingredients with water so that the batter has a runny consistency. Heat the tawa on high and pour a laddle on the tawa. You cannot spread this batter like a normal dosa. You have to pour it around. 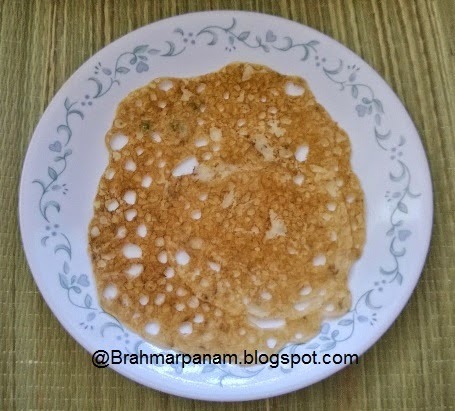 If you are unable to pour the batter freely or if the dosa comes out too thick, then add more water to the batter. Decrease the heat to medium and flip the dosa over when it is completely cooked on the down side. Once the other side is also cooked, remove it from the tawa and serve it hot. Repeat the above process for the remaining batter to make yummy hot instant Rava dosas!